With his contract to manage the Lagonda Works team terminated at frustratingly short notice in mid-January 1930, Arthur Fox of the Tolworth-based dealer and race preparation specialist Fox & Nicholl sought a new marque partner for the forthcoming season. Aided and abetted by Colonel Warwick Wright, he persuaded the Clement Talbot Ltd board to build and maintain three specially modified four-seater touring cars based on the company's recently unveiled '75' model. In return, Fox promised to source a team of drivers and pay all entry fees as well as taking responsibility for pre-race testing etc. After an ignominious start, the resultant trio of Works Talbot '90' cars proceeded to dominate the 3 Litre class at such prestigious events as the Le Mans 24-hour race, Irish Grand Prix, Tourist Trophy and Brooklands '500'. While, a single-seater version set a host of International Class and British Records including covering 500km at an average speed of 105.62mph. The spectacular success enjoyed by the '90' cars was all the more remarkable given that their engines displaced just 2276cc. Understandably keen to make preparations for the 1931 season, Arthur Fox began badgering Talbot and more particularly its chief engineer, Georges Roesch, for a full 3 Litre capacity sports tourer in October 1930. His persistence was rewarded some two months later when the factory not only agreed to continue its provision of Works cars but also published a catalogue listing details of a new 2969cc '105' model priced at £835. Based around a 9ft 6in wheelbase, the newcomer's sturdy ladder frame chassis was equipped with all-round leaf-sprung suspension (semi-elliptic front / quarter-elliptic rear), various cross braces and massive four-wheel drum brakes (just under 16in in diameter). True to Roesch's ethos that even Talbot competition cars should contain a high percentage of production car DNA, the first four Fox & Nicholl '105' cars (road registered as 'GO 51', 'GO 52', 'GO 53' and 'GO 54') also featured Luvax hydraulic dampers, thermostatically controlled radiator shutters and a single Zenith 48mm downdraught carburettor. Among the most unprepossessing looking but technologically sophisticated powerplants of the 1930s, the straight-six engine fitted to the '105' boasted a seven-bearing crankshaft, nickel chrome Swedish steel con-rods, four-bearing chrome-plated camshaft, vertically staggered inlet / exhaust tracts and diagonally opposed combustion chambers (the latter facilitating the use of 'oversize' 44mm inlet and 40mm exhaust valves). Shorter, lighter and more rigid than most of its contemporaries, race-tuned versions of the pushrod overhead-valve unit developed 119bhp @ 4,800rpm in 1931 and 132bhp @ 4,800rpm a year later (but were reputedly safe to over 5,000rpm). Bodied in aluminium over ash to contemporary 'Touring Car' regulations, the Fox & Nicholl 'GO' cars each sported a disappearing hood, detachable reinforcing strut ahead of the rear seats, cycle wings, fold-flat windscreen (complete with integral aero screen), 19in centre-lock wire wheels and an alligator tail housing the spare plus a thirty-five gallon fuel tank. Further benefiting from a close-ratio four-speed 'crash' gearbox, ultra-direct steering (1.25 turns lock-to-lock) and torque tube drive, the quartet's distinctive light Apple Green over Dark Green livery was reputedly inspired by Georges Roesch's fiancee who was a buyer for Debenham & Freebody's. According to Anthony Blight's authoritative tome 'Georges Roesch and The Invincible Talbot', the 'GO' cars enjoyed considerable success during the 1931 season at events as challenging as the Brooklands 'Double Twelve' (1st, 2nd and 3rd in class), Le Mans 24-hours (3rd overall, 1st unsupercharged car), International Tourist Trophy (4th overall, 2nd in class) and Brooklands '500' (6th overall, 2nd in class). As part of the ongoing relationship between Clement Talbot Ltd and Fox & Nicholl, 'GO 52', 'GO 53' and 'GO 54' were comprehensively re-engineered and rebuilt for the 1932 season. Boasting new chassis, engines, gearboxes and running gear, the reworked '105' Team Cars proved as competitive as ever with 'GO 53' running as high as 4th overall on the Mille Miglia and 'GO 54' finishing 3rd overall at the Le Mans 24-hours. 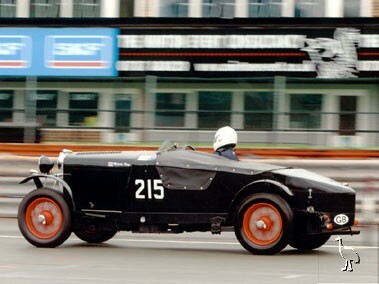 After the 'GO' cars the Talbot 105 was evolved into a highly effective endurance competitor; the three 'PJ' ('PJ 7361', 'PJ 7362', 'PJ 7363') team cars of 1932 and three 'BGH' ('BGH 21', 'BGH 22', 'BGH 23') team cars of 1934 dominating their respective Alpine Rallies. While, 'BGH 23' went on to set a number of Brooklands lap records. Unsurprisingly, numerous roadgoing AV 105s have been converted into team car recreations over the years including this particular example. Variously described by the vendor as being in "good" (electrical equipment, interior trim, paintwork), "very sound" (bodywork) or "very good" (engine, four-speed pre-selector transmission) condition, the open four-seater has apparently benefited from the extensive ministrations of respected marque specialist, Ian Polson. Purchased as a means of contesting the various events run by Duncan Wiltshire's Motor Racing Legends series, the Talbot is said to have "beaten Duncan's Bentley at the Algarve in 2009" and to have had "over £60,000 lavished on it in recent years". For instance, the 2009 / 2010 winter break reportedly saw the AV 105 treated to "a new cylinder head, camshaft, bearings, wheels and tyres etc". Eligible for a host of prestigious events and a competitive steed in the right hands, this magnificent Post Vintage Thoroughbred is offered for sale with V5C registration document and, unusually, FIA HTP papers. PLEASE NOTE: Since the catalogue went to press we have been sent photocopied invoices detailing the work carried out on 'ALR 944' since September 2005. By our reckoning the Talbot's previous keeper spent nearly £54,000 with Ian Polson, while the seller has had the Tourer further improved by both Mr Polson and RW Racing Services of Northampton - including a major engine overhaul - to the tune of almost £32,000. Suffice to say that this race-prepared AV105 is worthy of close inspection.